Small studio apartment decorating can be challenging, especially when it comes to creating separate zones and keeping clutter at bay. 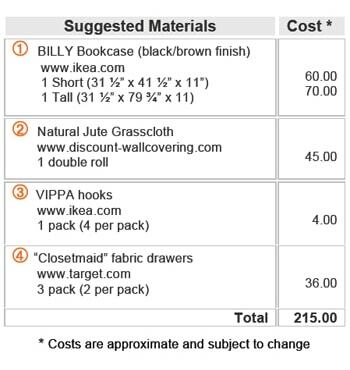 You’ll see how easy it is to create an entryway using Ikea Billy bookcases and natural jute grasscloth. This bookcase room divider serves many functions, including separating the bedroom from the rest of the space, and providing extra storage, crucial to organizing small spaces. And best of all, you can take your bookcase wall with you when you move out! Love your idea! I wanted to do something similar in my rented apartment where my bedroom is too big. I got Ikea pax wardrobe which I can now use as a bedroom divider! Thanks for sharing this video. Thank you so much for watching – glad you liked my video! Would love to see a pic of your project! This is absolutely perfect! Thank you so much for the great tutorial. I was looking for a way to better define the areas at my home since my door opens directly to the living room. I will be copying your idea so I can create a nice little entry way. Thank you Liz! So glad my idea was helpful and I hope you’ll share pictures of your completed project! Thanks for making this video! 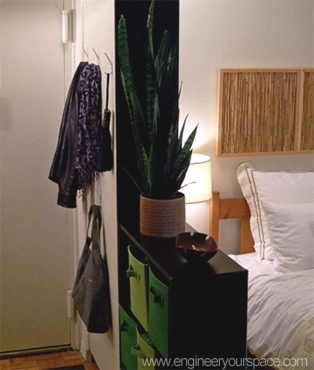 I’m actually looking into using the tall Billy bookcase as a wall divider for my new studio apartment. But I’ve been reading on some websites that they’re not stable. To use them as a wall divider, they’re obviously going to be free-standing. Are yours attached to the wall at all? Or anything else? I’m worried they may topple over. Glad you like my video! Yes, the tall bookcase is secured to the wall with a bracket (I show how I did this in the video at 10:15 secs). Since the shorter bookcase isn’t next to a wall, I attached it to the taller bookcase with screws making the whole installation very secure. Hope this helps! Great! but i have a baseboard….how would you anchor the bookcase or what options do you have with that? Thanks! I had a baseboard too which wasn’t a problem – there’s a small space between the wall and the bookcase which I didn’t find a problem. You just have to use a bracket long enough to screw to the wall and to bookcase (the bracket that comes with the bookcase worked just fine for me). 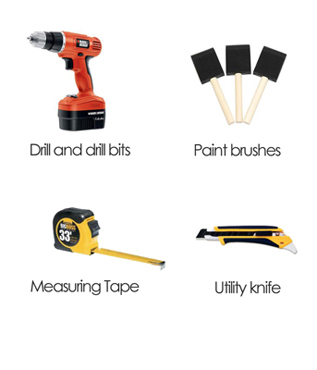 Hope this helps and would love to see pics of your finished project! Thank you! I trust your judgement and will go with Grasscloth as well. – only one or more screws to attach the shorter bookcase to the taller one? – you say in the video you used double sided tape to put the Grasscloth on the inside of the tall bookcase. Could you explain how you did that? Is it one big piece or in sections? Thank you! I can’t wait to have this divider! I should have done this 2 years ago already! I did you the metal bracket from IKEA but you can use whatever type works best for your situation. I recommend cutting one big piece the length of the bookcase, that way, if you ever decide to move the shelves, there won’t be a gap in the wallpaper where the shelf used to be. This does make the wallpaper heavier than if it were only in sections so you will want to put double sided tape not only along the edges but also in the middle of the grasscloth. 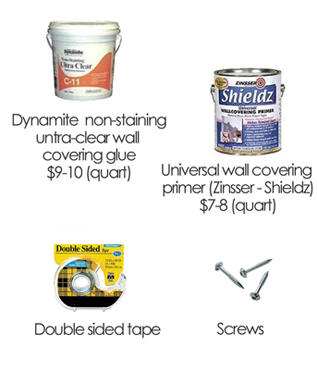 Hope this helps and I can’t wait to see how it looks in your home! Hey Isabelle, I am starting on the project (I hope I don’t mess up!!) and not surprisingly I noticed that, in the instructions to put up the tall billy bookcase, it shows you need to mount the middle shelf, which will not be removable. That made me wonder how you went about putting the grasscloth on the INSIDE of the tall bookcase (the one with shelves) with that annoying fixed shelf in the middle? Thanks! I am excited (and nervous)! Hi Isabelle, I was thinking, regarding my previous message of today (3/26): wouldn’t it be easier to prime the back of the bookcase and glue the grasscloth on BOTH SIDES of the bookcase’s back, BEFORE sliding it and attaching it to the rest of the bookcase? Do you think that would be feasible? Thanks! Sorry, Isabelle, I answered my own question from my second message: no, it’s not feasible because there are nails/screws involved, once the back is mounted. So the question from my FIRST message still stands! I just dealt with the area above the fixed shelf and below the shelf separately, meaning, I cut one piece of grasscloth to fit the area above, and stuck that to the back of the bookcase, and then put in the adjustable shelves, and I repeated the same thing for the bottom area. Don’t stress about this, you can do it and it will turn out beautifully! Wow! Beautiful job Maria!! It’s perfect for the space!! Looks amazing, love the grasscloth and the pops of red with the white! Seeing this really makes my day, thank you for sharing what you did I would love to share it on my #EYSinspired board, fb, etc. if that’s OK with you? I think it will inspire others! On to the next Isabelle-inspired projects! Thank you!!! It’s a lot of fun and very gratifying! !